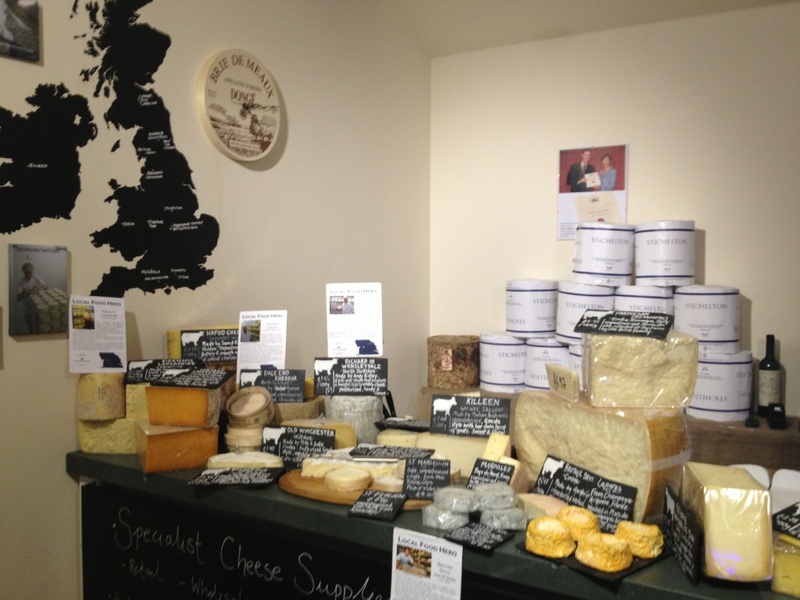 The Courtyard Dairy, specialist cheese refiner and purveyor…. I popped in to The Courtyard Dairy near Settle to meet Andy Swinscoe and Kathy Bull this week and was delighted with the company, the cheese and the knowledge, a fantastic gem of a foodie shop and just on my doorstep. 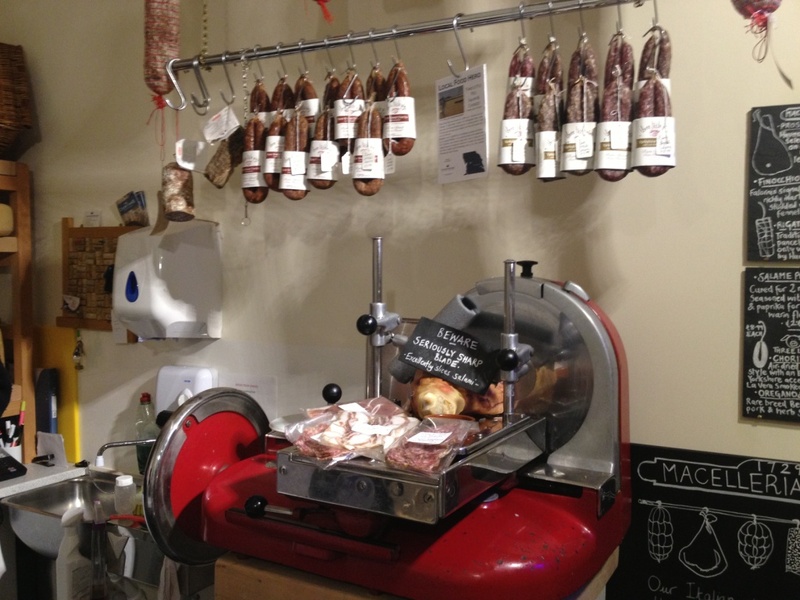 Andy has managed to obtain a lovely Baby Berkel manual slicer and uses it for his pancetta and salumi, a very similar model to my Baby Berkel bacon slicer of the same ilk. 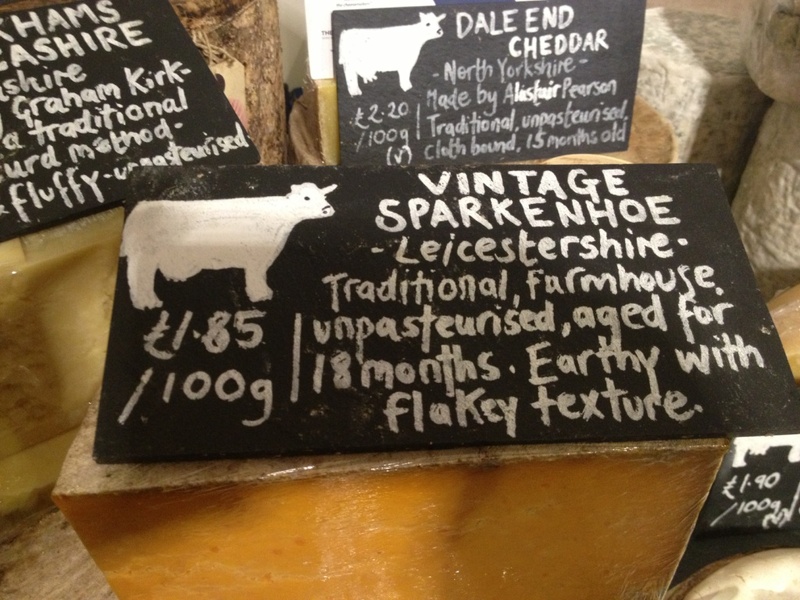 Of course I tried a few of the wonderful cheeses on offer including the Sparkenhoe Farm Red Leicester, a vintage 18 month matured cheese made with unpasteurised milk, which was delightfully earthy with a flaky texture..
Dale End Cheddar, Made by Alastair Pearson in Bottom, North Yorkshire must be our own “local” cheddar, a traditional unpasteurised, cloth bound 15 month matured cheddar and simply like no other cheddar I have ever tasted. Hafod Cheddar, made by Sam & Rachel Holden in Lampeter, Wales a buttery, smooth cheese with a long but mellow cheddar finish, I can still imagine the flavours. 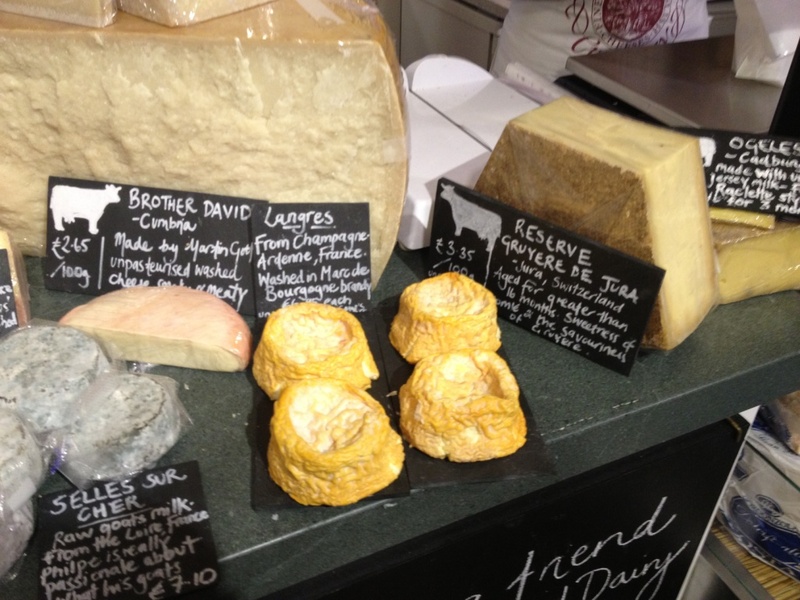 From the Gott family in Cumbria Martin Gott produces “Brother David” an unpasteurised cows milk cheese which is also a washed cheese with a meaty taste, made using milk from a small herd of Dairy Shorthorns, creamy with a smoky mildly tobacco flavour. Langres, Champagne, this classic French cheese washed in Marc de Champagne brandy, this really was on top form, ripe and ready to eat, you can see it trying to escape the slate in the picture above, like eating “clotted cream custard” but cheese! If your visiting The Dales or travelling near Settle do call into The Courtyard say hello to Rob at Buon Vino for a browse of his top wines and of course try some of Andy’s cheese. The Brasserie on site also offers more substantial victuals or a good cup of coffee for the weary traveller. Andy Swinscoe fell into cheesemaking at an early age working for Paxton and Whitfield. He then did a cheese affinage apprenticeship at Mons cheesemongers in France and was awarded a Queen Elizabeth Scholarship for ‘Cheese Maturing’. After his time in France Andy became quality manager at The Fine Cheese Co. in Bath before setting up his own cheese shop, The Courtyard Dairy, in Settle, North Yorkshire in 2012. 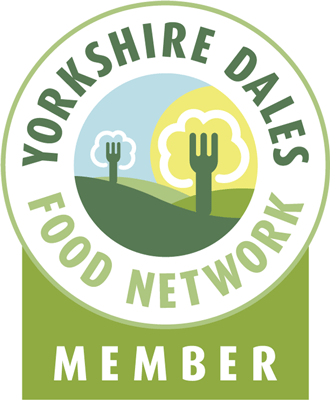 This entry was posted in charcuterie, cheese, Yorkshire, Yorkshire Dales Food and tagged affinage, charcuterie, cheddar, cheese, cheese shop, cheesemakers, Courtyard Dairy, Dairy, dale end cheddar, Food, hafod cheddar, Langres, North Yorkshire, salumi, settle, Sparkenhoe. Bookmark the permalink. Yes, great people, great shop and the cheese is great as well, I went down there just before Christmas and got 5 or 6 cheeses. Put side by side with some supermarket cheese over the holidays on the cheeseboard, the taste difference is amazing !! Reminds me of a little place called Wisconsin!